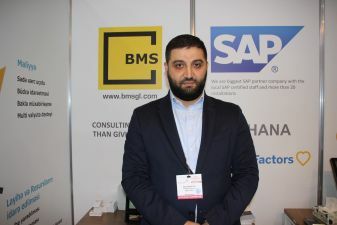 - BMS Global is the official partner of SAP in Azerbaijan and represents the entire product line of this world-renowned software developer for organizations. We are the only ones in our field who have almost 40 own certified SAP consultants of international class products. SAP products automate business processes. SAP produces automated systems for managing the internal processes of an enterprise, such as accounting, trade, manufacturing, finance, personnel management, etc. BMS Global provides a complete implementation cycle for SAP products, including installation, sale of licenses, technical support, etc. By participating in the exhibition, we want to draw attention to our activities and SAP products, make useful contacts with potential clients. We hope to hold meetings with the heads of IT departments of companies and enterprises, people who make decisions about the implementation of business automation systems in their organisations. We wish all participants a successful work and invite all interested visitors to our stand!